It’s been almost a year since we said good bye to our sweet canine companion, Phineas (aka Phin, Phinny, Mister, Brown Boy, The Boy, or sometimes just Dirty Beast). He was 11 when he set off on his “retirement tour”, and with his snowy white muzzle and slightly arthritic legs we had our doubts about how this aging old man would take to travel. Turns out he loved it. We should have known that this lifestyle would suit him. 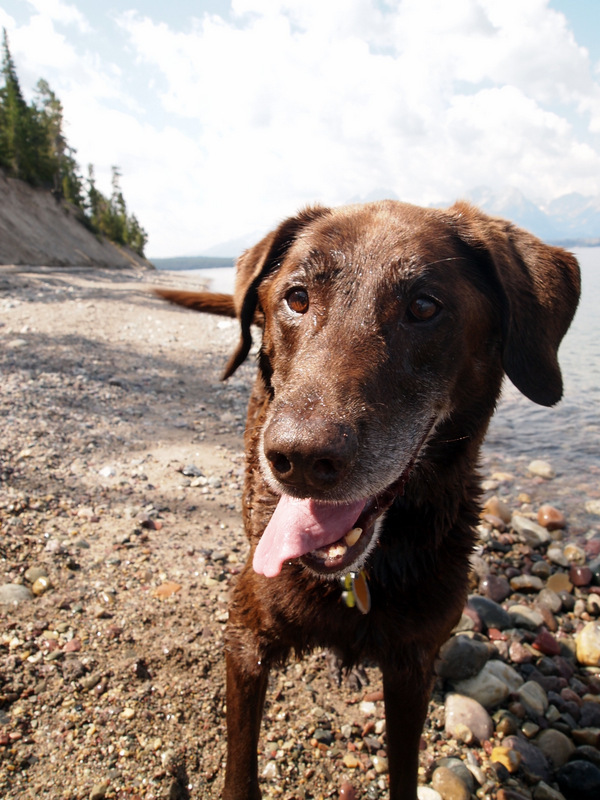 After all, his favorite things had always been swimming, riding in the car, and spending time with us – in that order. All of these activities were plentiful during his year and half of travel, and I think he may have even set some sort of record for the variety of water sources swam in by one dog. After he passed we knew it would be a little while before we got another dog. Not only did we need time to grieve for our long time companion, but we also wanted to experience the freedom of traveling without a dog. Now almost a year later we are still a dog free household. Not because we don’t love dogs and think about inviting one into our lives nearly every day, but because the truth is that there are some definite advantages to traveling without a dog. Really they are. Dogs are loyal, loving, cuddly, perpetually happy, never hold a grudge, and always excited to see you. I like to use the word companion when I talk about dogs instead of pet, because I think it perfectly describes the relationship between dogs and humans. Dogs might rely on us for their basic care needs, but we rely on them for their unwavering devotion and relentless positive energy. Dogs are a huge source of joy for their owners, and have the amazing ability to turn even the most monotonous walk around the rest stop parking lot into an adventure. Dogs need regular exercise. So do people. Which makes us perfect for each other. Tim & I are generally good about getting out for our daily dose of exercise, but I admit that there are some days when the weather (or laziness) hold us back. Dogs do not allow this. Dogs will insist on several walks a day, even if it is raining, or windy, or cold. We used to take Phin for a nightly walk around the campground. Now we very rarely get out for an after dinner walk. It’s not that we don’t exercise without a dog, it’s the fact that we have the option to skip it. We don’t really do long travel days. Our lifestyle is not about rushing from place to place, and we generally stick to 2-4 hour drives. We also try to enjoy our driving time by stopping along the way for lunch or to stretch our legs. But sometimes we just power through the drive without taking the time to enjoy the part of the country we are traveling through. When we had Phineas we stopped a lot more often. And not just for a quick bathroom or snack break. We often found a river or lake and pulled over for an hour or two while he paddled around and chased the ball. Sometimes we stopped for a short hike or walk in the park. Of course we can still do these things without a dog, but they are not nearly as much fun. Most dogs are great at protecting their territory. They bark when people walk past or knock on your door. Not so great in crowded RV parks when that little Chihuahua yips at you for ten minutes when you walk past, but really great when you’re boondocking in the middle of the forest or desert with no one else around for miles. We’ve never worried too much about security or theft, but we always felt better knowing that our pup’s deep, loud bark would warn us of intruders, or maybe even keep those intruders away. There are lots of places that dogs can’t go. National Parks are the big one. We brought Phin to a few national parks, but he was only allowed in the parking lots and campgrounds, which severely limited his enjoyment of the park – and ours. We love national parks, monuments, preserves, historical sites, and recreation areas. While we understand why dogs are not allowed at these national treasures, it often meant deciding not to go, or leaving our pooch home alone. He was also not allowed on many, many beaches, which made our water loving pooch very sad. This was a constant source of worry for me. When we lived in a traditional house Phineas would regularly stay home for 8+ hours a day while we were off at work, but for some reason leaving him in the RV for even a few hours always felt wrong. Every time we left him I worried. He was always fine, but the worry never went away. There was a limit to how long he could stay home alone though, and this in turn limited our activities. Say we wanted to spend the day exploring a city (like we did last weekend in New Orleans), or go on an extra long bike ride, or spend the day at a museum. Either we made those trips in an abbreviated fashion, or we didn’t do them at all. The major difference between leaving your dog alone in a RV versus a house is the heat factor. The smaller size means RVs have a tendency to heat up and become a dangerous place for dogs. The obvious solution is to use the air conditioning. But what if the power at the park suddenly shuts off (which can easily happen on a hot day when everyone has their AC on)? Or what if you’re like us and enjoy public parks with no hook-ups, or boodocking in the wild where our battery power can’t run the AC? Our two ceiling vent/fans do a great job of cooling, but sometimes they weren’t enough, and we simply couldn’t leave him. Dogs come in all sizes, some obviously more suited to RV travel then others. Phineas was a large dog. About 90 lbs at his largest, with extra long legs for a lab. He took up quite a bit of space in our 200 sq. ft. house. He had several dogs beds that hogged up a bunch of floor space, and when he sprawled out on the couch there was hardly room for anyone else. We were constantly tripping over and stepping on him. He also traveled with a lot of stuff. Two large bins of food, a tub of treats, multiple dog beds, balls, frisbees, collars, leashes, and bowls for food and water. When space is at a premium every little bit counts, and making room for a large dog plus all his goodies was sometimes a challenge. This is a huge part of living with a dog. No matter how fastidious you are about cleaning there will always be dog hair in the corners and dirt tracked in on those furry paws. The hair is much more noticeable in such a small space, and it was a never ending battle to keep the floors clean and the furniture fur free. We still miss our Phineas. We miss having a doggy companion, and despite all the downsides, we will most likely travel with a dog again someday. Because even though they take up space, track in dirt, and limit where you can go and what you can do, dogs are simply awesome, and that in itself is enough to make it all worthwhile. What do you think? Are dogs worthy travel companions, or is it simply too much of a hassle? Great post. 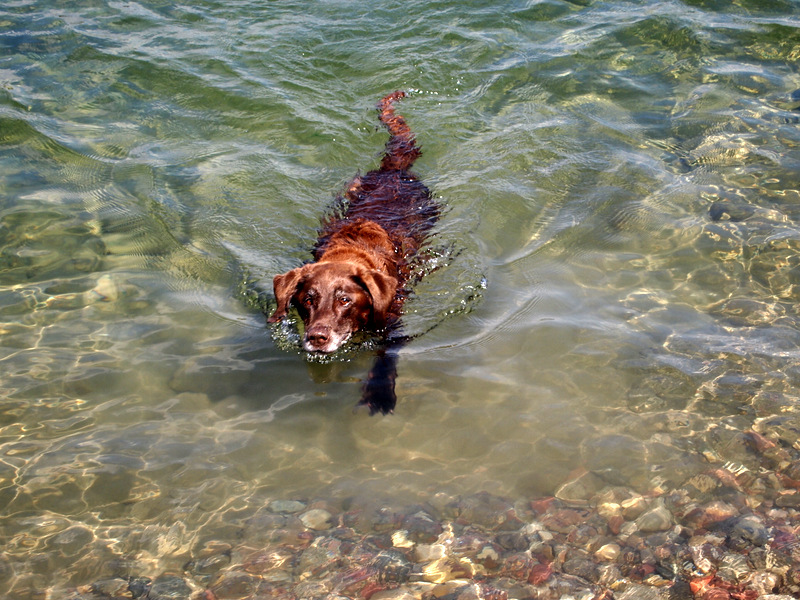 We only travel 3-4 months in the winter with our 25′ Airstream but our rescued Vizsla, Penny, loves it. She too is getting older and we dread losing her but she loves to travel with us. Same issues — we miss out on stuff because we can’t leave her (she’s got separation anxiety issues) very long. It’s a tradeoff but we wouldn’t have it any other day. She’s about 60 pounds so she takes up a lot of space. Safe travels. I love the name Penny for a dog! We thought we might wait until our older pup passed to begin traveling, but I am so glad we didn’t. He loved it so much, and we got a ton of enjoyment out of having him with us. Dogs really steal your heart don’t they? So glad you wrote this. Last extended trip out, we were dogless, but this one coming up we will have our little chug dog with us. Good to hear the highs and lows. It’s one of my biggest concerns! For the national parks, were you ever able to find places to board him? We never looked for places to board because he hated it so much! But I know they are out there and probably easy to find around the national parks. We just lost our beloved kitty (Spotty) last week. She was 19 1/2 and traveled with us for the last 16 months. Had we known that she was going to be such an awesome traveler, we would have started full-timing sooner. We’re heartbroken that she’s gone. But we won’t get another cat or dog until we stop full-timing, which won’t be for at least a few years. Like you, we worried about leaving her for too long, or if it was too hot. Having her with us really made our trailer feel like home, though. I am so sorry about the lose of your kitty. I know how hard it is to say goodbye. Even so many months later I still get a little sad when I see pictures of Phineas. We almost put off full-timing until he passed, but in the end decided to just bring him and see how it went. I am so happy we made that decision. I think for our pets the best part of traveling is how much time they get to spend with us. I can totally understand why you won’t get another pet until you stop traveling. It’s definitely easier without them, but that doesn’t mean you won’t miss having a pet. I wouldn’t trade the time we had with Ghost, a Siberian Husky, for anything. He shared his life with us for 12 years and accepting that it was his time to go there at the end was a difficult thing, but I have to admit the freedom of traveling, hiking, camping and general outdoorsing without him is hard to beat. It wasn’t until he was gone that I realized how restrictive the responsibility of sharing my life on the road with a dog was, like having a 4 year old that’s never ever going to grow up and leave home! As long as you kept him away from other dogs Ghost was not a barker, so leaving him behind in the camper when necessary wasn’t terribly traumatic for us or apparently him, but more importantly also for those sharing the campground with us. I suspect that finding another dog like that would be difficult and a hit or miss proposition, (And of course by the time you figured out the dog’s a serial barker you’ve bonded with it so trading it in for another model is not an option!) and I don’t like listening to the constant barking of a dog that thinks it’s been abandoned forever any more than the next guy, and certainly don’t want to risk being known as ‘that guy’ that subjects other campers to that particular brand of unpleasantness either. Some of Ghost’s ashes, along with my father’s last pair of work gloves, ride with me on the dashboard of my van, so they’re still both out there doing the traveling and camping they loved right along side me, but it’s been 11 years since Ghost moved on and we, not even my wife who stays home now while I’m on the road, haven’t once been seriously tempted to bring another dog into our lives. Maybe that’s selfish, or maybe we just feel like he was a one of a kind and, so far anyway, we’re content with the memories. Great post, and very true to my experience as well. I had a ~45# canine companion for 16 years and we did a lot of traveling together, plus stayed at a fixed location for awhile in a small travel trailer. I had the same feelings/worries as you (plus the same good points!). It is different leaving them in a in a “thin skinned” conveyance vs. a house. My pooch died five years ago and I was heartbroken. I knew I couldn’t get another dog for a good long while as “I only wanted an exact duplicate” — and of course that’s just wrong and impossible. Then, by the time that somewhat wore off (now), I find I have such mixed feelings. I so, SO miss having a canine companion, but… I now realize I have grown used to the freedom and do enjoy the benefits of that. And giving those up is a 15-year commitment, basically. So it’s a hard choice for me now! Anyway, great post with a good balance, IMO. I do feel that the longer we go without a dog, the more we will get used to the freedom, and the harder it will be to get another one. But then I think about having a dog in my life again and all those concerns go out the window. As you said, it brings up a lot of mixed feelings. And like you, I have always been a big dog person, but a smaller one sure would be more convenient for travel. Good luck on your eventual decision. Ditto ditto ditto. We lost our dog Kona just a little over a year ago and we’re having the exact same debate as to whether to enter in to another long term relationship with all these pros and cons. We’ll probably go for. Life is just messy this way. You said it! Life is messy and we don’t always make the most practical choices. I have no doubt that we will end up with another dog some day because I can’t imagine living much longer without one. Great article, Amanda – we’d been thinking of writing something similar, but didn’t have any experience traveling without dogs! With the biggest of our three being 60 lbs, then 20 lbs and 10 lbs, they factored heavily into our recent decision to move from an Airstream to a small class A. Everyone is happier and we have more storage indoors, so we aren’t digging dog food out of our truck every day. It also gives us the opportunity to have an auto generator start installed, which will alleviate many of our fears about leaning them alone in hot weather. The 30 amp breaker flipped at the campground’s power pedestal last year in Albuquerque and the RV was almost 100 degrees with the dogs inside when we got home from an hour-long grocery run. We never left them alone in hot weather again after that, which meant missing out on some things last summer. When we don’t have the biggest dog anymore (she’s sadly getting to be a senior dog) we may downsize again and reconsider how we travel a little. We’ve been putting off some trips away from the RV that would require a hotel room or house rental because they usually have size limits for dogs. She also doesn’t crate or board well, so we’re restricted to in-home pet sitting or a family or friend coming to our RV. Enjoy your time without obligations while you decide what’s best for you, and do what we do with other people’s kids – spoil them and give them back! You should write an article about traveling with 3 dogs! I can see how that factored into the decision to upgrade your RV. I can’t imagine trying to squeeze three in here. The auto start generator is huge thing as well. That does give you some peace of mind when you leave them. There are definitely additional challenges that go along with having a senior dog. Our pup was beyond the point of being happy with a boarding situation so that was never an option for us. I am a believer in the universe providing what we need when we need it – and I won’t be surprised when I eventually read one of your post’s that says “Guess who came into our life today”! Enjoy the things that a dog free life allow you to do and then open your arms and hearts wide when the next ball of fur lands at your doorstep!! I traveled this past summer throughout Wisconsin – South Dakota – Wyoming – Montana – and then back home to Maryland with my new rescue pup Ollie, a 50 lb, year old, golden mix. We were traveling in my mini-van that I tricked out to be a little tiny house on wheels – it worked out way better than I could have imagined. Yes, there were many times that I couldn’t do certain things – but it was so awesome to have him along for the journey!! I enjoy reading your adventures – thank you for sharing! 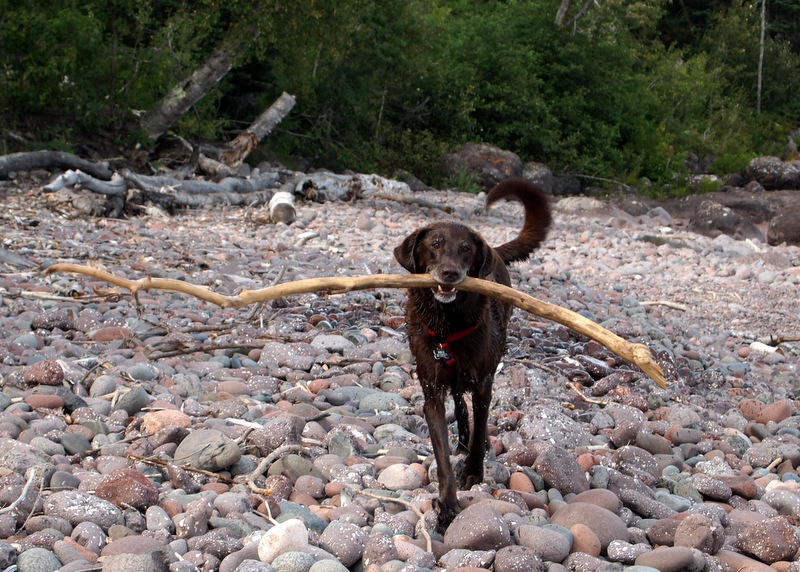 And the pictures of Phin in this post are great – he looks like he was an awesome dog!!! We are totally dog people! In fact, this is the first time in my life that I’ve been dog free. It’s very strange. I agree, the right dog will come along someday and we will embrace him or her and forget all about all those minor inconveniences. Ollie sounds like a wonderful dog. So glad he got to come along for the adventure. Your analysis is spot on. We’ve traveled with and without a furry companion. Our precious little sweetie passed away during our first year of living aboard our sailboat. We ‘enjoyed the freedom’ of traveling without a pet for about 4 years. It’s absolutely true that you have more freedom and less to worry about. We were sailing in Europe when a fellow boater asked us to babysit his dog for a couple of days. That was it! We knew we couldn’t go another year without a dog in our life. We got Lucy and she sailed with us for our last few years on the boat and is now traveling with us in the RV. She brings us more joy than any museum or monument ever could. At the end of the day, I think life is about making memories. When we reminisce about fun times, funny times and great memories, it’s always memories which include Lucy and/or our grandkids. It never feels like a sacrifice was made. So you’re saying is that if we want to remain dog free we should not volunteer to pet sit? I can see how that would put me over the edge. I agree about the memories. While writing this post I went back and looked at a ton of photos of Phin and the old blog posts I wrote when he was with us. I am so happy to have those memories even if it did mean that at times we had to make certain sacrifices. I couldn’t agree more with every single pro and con. I find myself frustrated with our two dogs when they’re taking up way too much space in our tiny truck camper but then I remember how, without fail, they make me smile and laugh every single day. No matter the hassle, dog are the best! Yup, dogs are awesome. They may take up room and get in the way, but they bring so much joy to our lives. Excellent post! The pros and cons are spot-on, and since we travele with an 80-pound Shepherd and 35-pound Shar-pei, I’m especially sensitive to your comments on space and dog hair! One pro I’d add is that, with a dog, you find places you might not have if you didn’t have a dog. The national parks are a pain, no doubt, so when we’re visiting one we make a point to track down a national forest nearby. They’re almost always dog friendly and have fantastic trails! Some of our best days have been ones where we dug a little deeper to find an activity where the boys could join us. Wow, that’s a whole lot of dog (and fur) to travel with! Great comment on finding new places. We definitely experienced that. We were always trying to find a spot for our boy to swim and as a result discovered a bunch of great lakes and rivers that we probably would have otherwise passed by. Thanks for the excellent post Amanda. Serene and I agree with all your points. We love our 85 lb, 10 year old, rescue black lab Elko. We have had him 5 years and feel he rescued us from being without him. He doesn’t like to swim which we think is strange, but it keeps the 5er cleaner. When we eventually lose him, we want to experiment with the freedom of not dog. Our last dog, 15 year old rescue took us over two years to recover from before getting Elko. But for now, Elko is worth *way* more than the inconveniences you correctly pointed out. A black lab who doesn’t swim, that is odd! But as you said, dry dogs drag in a LOT less dirt and mud. So happy you’re enjoying traveling with Elko. While we do enjoy the freedom right now, I am sure that eventually we will break down and find another dog to join us. We couldn’t imagine traveling without our 3 furry friends, but the cons are all true. The one extra thing we do have is auto-generator start for our rig in case it gets hot and power goes out. That way we can ensure the pets stay cool. Like you, we do not like to leave our Labrador, Zoe, alone in the trailer, so she goes everywhere with us. As you said, that restricts what we can do, but her joy and enthusiasm for the traveling life far outweigh those restrictions to us. Also, another benefit to traveling with a dog is that they are wonderful icebreakers. We have met a lot of people who approach us because of Zoe. Dog lovers are everywhere! Thanks. Our Zoe is a photogenic one, as was your boy, Phineas. Love the labs. We specialize in Zoe pictures on our blog: http://olddogsnewtruck.wordpress.com/ Seriously, she’s a big part of our trip. I’m glad your doggy got to enjoy his retirement cruise for as long as he did. Great post! Thanks for writing this. We like the idea of a dog, but the reality of a dog is a lot of responsibility. So for now, no dog. This was a really good post; well organized and well written. I think if we had started off traveling without a dog that we wouldn’t even consider adding one to our home. As you said, while the idea is nice, the reality is that they do change the way you travel. So sorry about Rusty. I don’t think we ever really get over losing a dog :( The crate method is a great idea in an RV. Phineas was pretty calm, so we didn’t worry about him getting into mischief when he was alone, but I do worry that if we ever get another dog that won’t be the case. I think crate training is an excellent solution. Especially with three large dogs. I would love to see your clown car routine! Thanks for your good wishes Amanda. I know you know how difficult it is. Yes, crating is really helpful. We just hold the door to the crate open and say “go to your house” and they each willingly go right into their “usual” crate. Our solution for where to to put the crates was to lower the dinette into the “bed” position and line the three crates up on the bed platform without any cushions under them. The cushions slide right into a cubby under the bed area and it still leaves us with all the storage under the two bench areas. This solution also solves the issue of them barking or scrambling at a window if they were to hear or see another dog when they are left in the rig. They just take a nap until we get home. We know how long we can leave them, and we have the peace of mind of not worrying about them. We actually leave soft music on for them too–very restful! :-) And we always make sure we have reliable temperature control for them. We’ve thought about removing the dinette completely, but for now this is our solution. As you well know, there are always compromises with space in our world of RVing, but we still have room for our power recliner love seat, and my desk area. We keep another set of crates at our daughter’s home in Northern Virginia (where we are now while the rig is undergoing a major remodel–a whole other exciting topic!) and we crate them here when we leave the house too. The thing is, if you work with crating with a dog, they are denning animals by nature, and they actually like their quiet time in their “dens”–we usually give them a little treat reward when they go in too. Our Border Collie practically becomes airborne to be the first to her crate so she can have her treat! Big time Lurker here! As well as lurking on Aluminarium and Wheelingit … Your posting as others have said is spot on. We too just had our one year date since our travel companion left us, and being dog people like you, we’ll get another one eventually. We miss the muddy paw prints, tumbleweeds of fur blowing across the floor, gaseous moments in confined spaces … but we also miss the walks, the meeting of people, the alerts to possible problems, and the unconditional love. When the time is right for you guys we hope you find that special someone. I love it when the lurkers make themselves known :) So sorry about the lose of your traveling companion. It’s a hard adjustment isn’t it? As you said, we miss even the things that seemed like such a pain at the time, like the hair, and dirt, and even those “gaseous moments” as you so delicately put it. Thanks for commenting. Like many, we could not imagine traveling without our dog. We started out with two, one golden (Bailey) and a puggle (Daisy), We lost Bailey last April and miss her every day but at over 100 pounds you definitely knew she was around! Daisy is a mere 16 pounds and is a very good traveler!